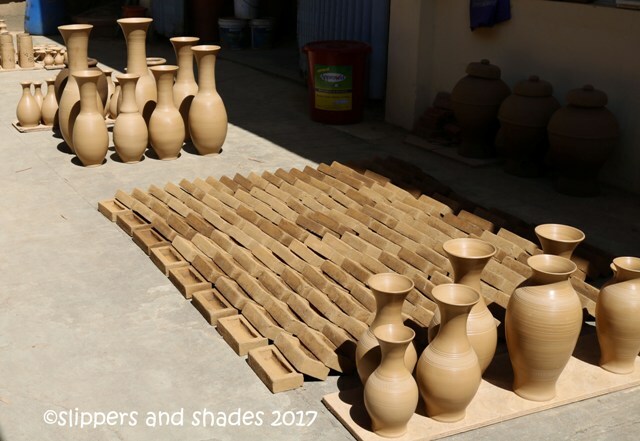 Philceramics introduced the modern technology of pottery making in Tiwi. 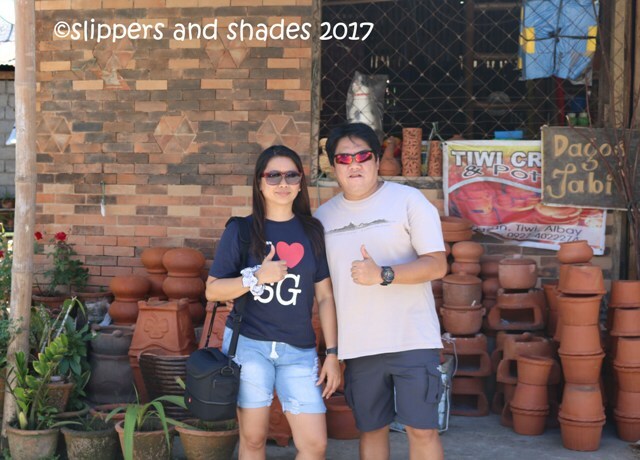 They are now the leading terracotta ceramic industry in Bicol Region. 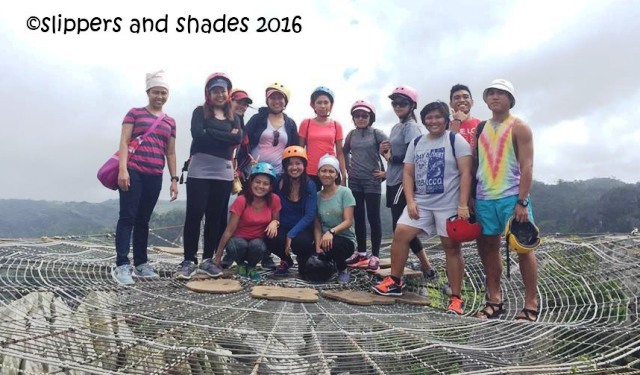 This is a project of Department of Tourism and funded by the Philippine Government under the General Appropriations Act of 1994. Just like our first visit here, I was again fascinated by new sets of beautiful vases attractively arranged on the display hall which was divided into three sections. If only I have a big house, I will buy all items that please my eyes. But I have to resist this impulse because our van cannot accommodate lots and lots of boxes inside. 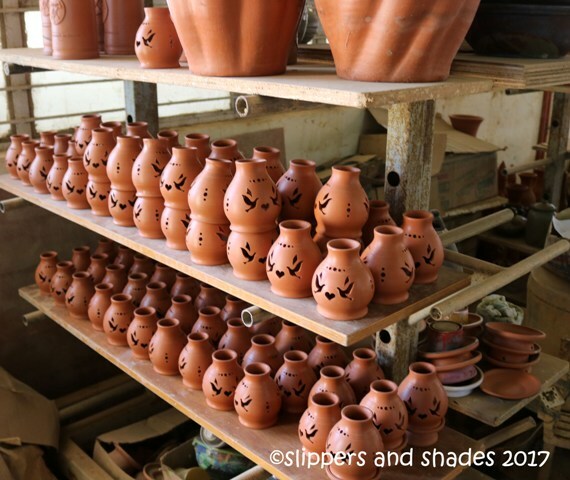 Outside the facility were flower pots being dried under the sun. Near the main entrance was the big oven that is used for baking the molded pots and jars. This was the first time that my mother will visit Philceramics so before we proceed on spending; we toured her inside the facility to see how these products are being made. There were three potters busy molding a certain jar on top of an electric-driven throwing machine. I was fascinated watching the actual process how it was shaped in a desired form. Men were the potters and women design the jars and pots. Minutes later we headed to unfired earthenware with various shapes and designs lined up on a drying rack. Three mixtures are used to make a pot. These are the himulot na pula (the red clay), himulot na itom (black clay), baras (feldspar) and then water is added to complete the formula. It was amazing to ponder that the century-old pottery in the town of Tiwi had evolved so much. 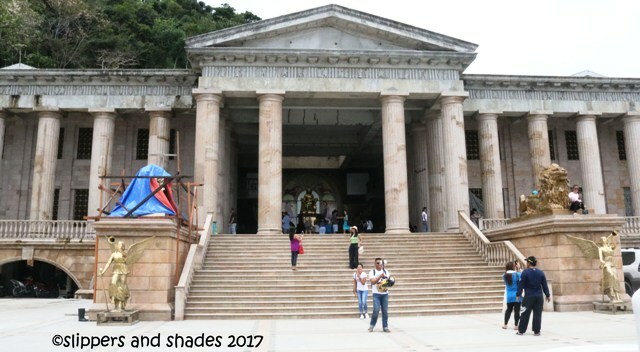 It was transformed into a world-class decorative ceramics which are frequented by visitors coming from Manila and other parts of the region. 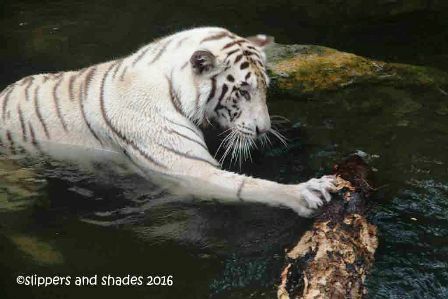 It’s good that Philceramics had adopted the modern technology. 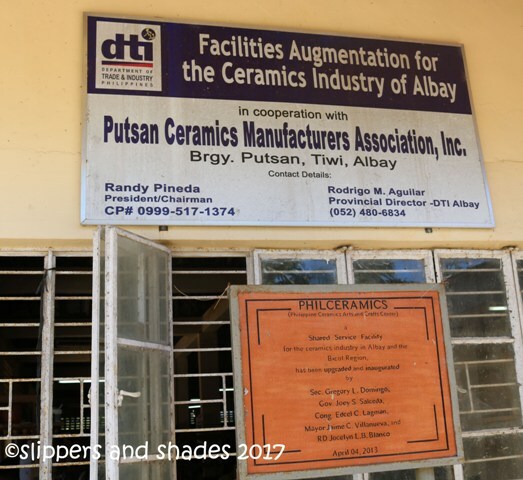 I had a happy conversation with Nelia, one of the workers in Philceramics who was so thankful that the cooperative PCMA (Putsan Ceramics Manufactures Association) was formed. 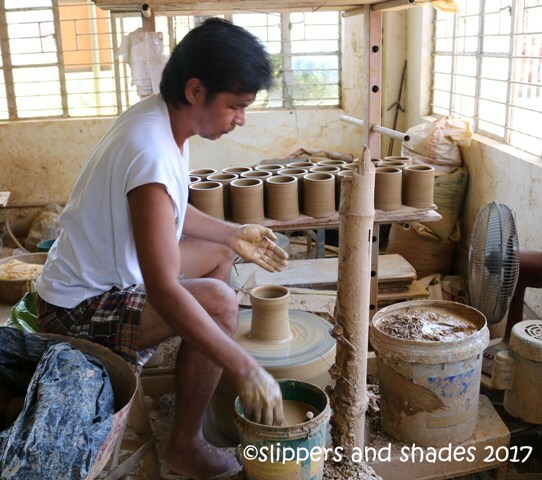 They were provided a sustainable livelihood and the rest of the people of Barangay Putsan through pottery making. She was happy to see many people buying their products. But there are locals who are still using the traditional method of making pots. Molded clays are being dried under the sun beside the road and they burn hay as their method of baking. After a satisfying tour that seemed to be a kind of field trip, we now headed back to the store and bought several sets of these lovely jars. 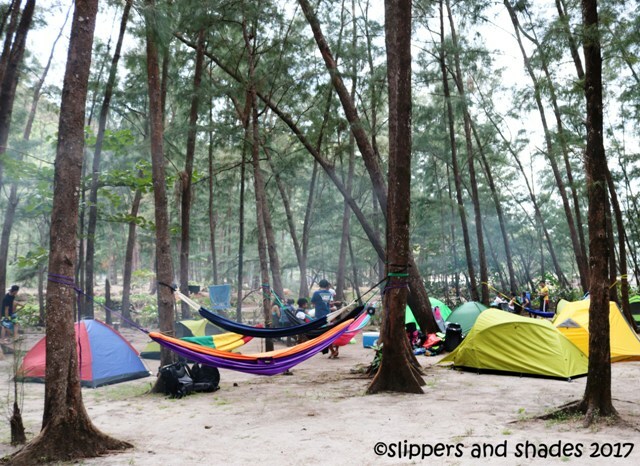 Their price was cheaper compared to malls in Manila. A 3-set elegant vase costs P400 only. Other items we bought were key-chains (P10 to P35), ref magnets (P35), wind chimes (P75), lamp shades (P65 to P120) and aromatherapy burners (P60 to P300). We were happy and satisfied buyers when we left Philceramics. On our way to the city proper of Tiwi we passed by several pots, piggy banks and other toys made of clay being dried up under the sun beside the road. Those traditional items brought back the nostalgia of my happy childhood in Albay. 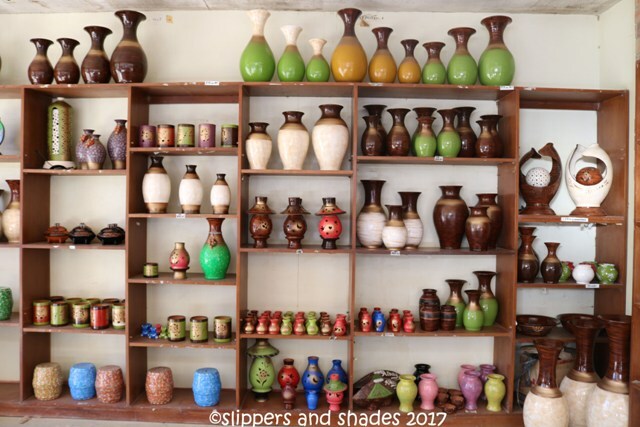 This entry was posted in Adventure, Albay, Archive, Articles, Philippine Travel, Philippines, Travel, Travel Archive, Vacation and tagged Albay, Barangay Putsan, Ceramic Jars, nature, Outdoors, people, PhilCeramics, Pottery, recreations, vacation, Vase by shadesandslippers. Bookmark the permalink.